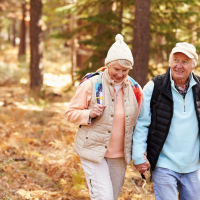 Older people can improve their chances of living longer by nearly a quarter simply by walking briskly for 15 minutes every day, according to new research. France-based physician David Hupin, from Saint Etienne's University Hospital, says the over-60s cannot use their advanced years as an excuse for staying inactive. Experts say this small switch in lifestyle can help ward off dementia, Type-2 diabetes and several other chronic conditions. Dr Hupin presented his findings at this year's EuroPRevent conference. The research looked at over 120,000 adults over 60 years old. Holidays need not be any barrier to an older person's exercise regime - in fact, they can even stimulate their programmes. Bracing beach walks and enticing trekking holidays in beautiful foreign locations can be huge incentives, especially with the peace of mind that over-60s travel insurance can provide. Dr Hupin says it is well documented that no medical treatment can match regular exercise for better health and well-being. But most older adults do not hit the recommended guidelines of a minimum weekly programme of 75 minutes' strenuous exercise or 150 minutes' exercise of average intensity. The doctor says that over-60s who are contemplating getting fitter should do so incrementally rather than making a big, immediate step-up to the recommended minimum amount of exercise. Dr Hupin says that 15 minutes' exercise a day - such as a brisk walk - should be within the grasp of most people from this age demographic. Public Health England's Justin Varney says that people are never too old to begin physical activity. The expert says exercise can help to keep dementia, Type-2 diabetes and several other chronic conditions at bay.